If you’ve upgraded the firmware on your BeagleBone or BeagleBone Black in the past, the experience will be quite similar, but you might find the eMMC flashing times a bit faster (~15 minutes rather than ~45 minutes) due to less post-installation processing. Using the 2GB uSD card image also flashes a bit faster and can be resized to whatever your uSD card size is using some scripts under /opt/scripts/tools. Many, many thanks to Robert Nelson, Rob Rittman, Dave Anders, Cody Lacey, the Cloud9 IDE team and so many others in getting us this far. 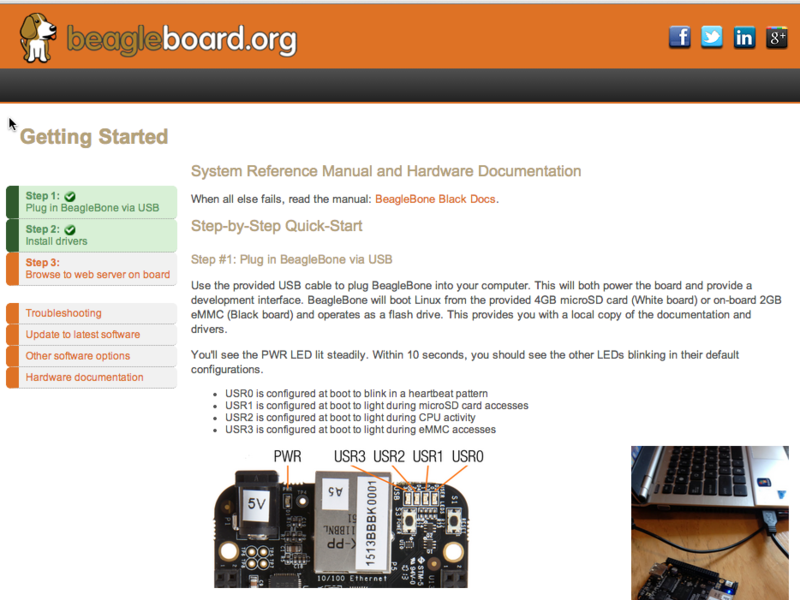 I’ve introduced a few bugs to the documentation (http://github.com/beaglebone/bone101 and http://beagleboard.github.io/bone101), so expect to find a lot of issues there. Patches are welcome as are notes in the bug tracker to make sure I don’t miss dotting any i’s or crossing any t’s. This is your chance to try to get some documentation into the system you’d like to see. I felt it was pretty safe to save the documentation as an in-beta item because it shouldn’t impact functionality. 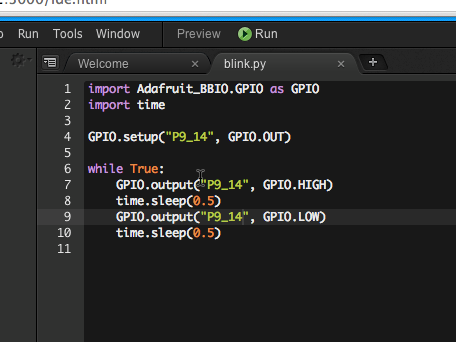 This is a pre-open-source-beta-only release of version 3 of their IDE. 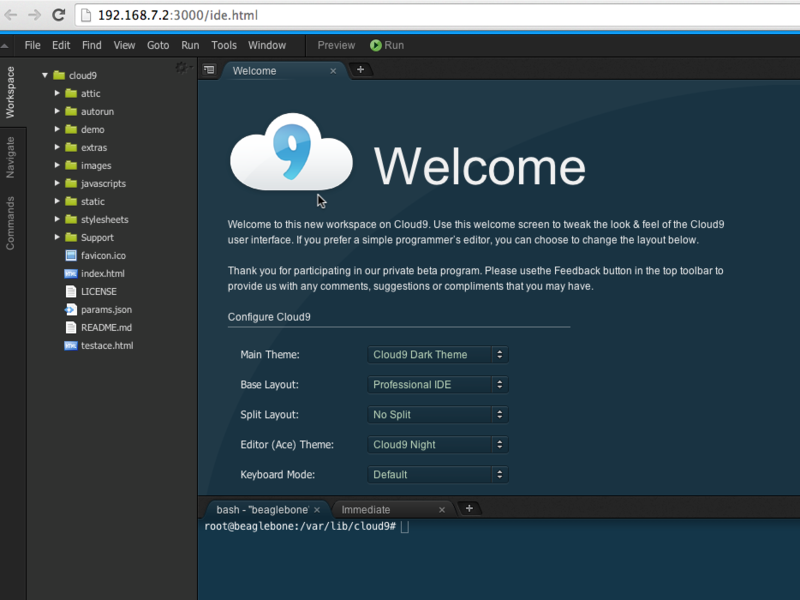 Down at the bottom of the Cloud9 IDE you’ll see a new terminal window that runs a full ‘tmux’ session. You can open up a bunch of these and it makes logging into the board and executing command-line operations *super* simple. 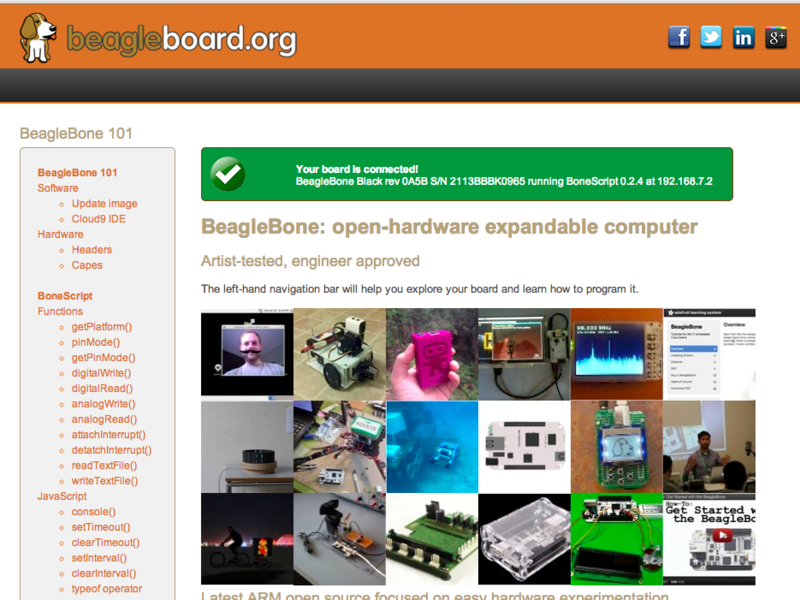 You should also note that the /var/lib/cloud9 directory now contains a git clone of that bone101 repo (http://github.com/beagleboard/bone101), so you can start using the Cloud9 IDE to edit the content live. What I recommend is creating your own fork of the repo and sending me pull requests of any changes you’d like to see. For more advanced C/C++ developers, future releases should include https://github.com/jackmitch/libsoc. Those familiar with Linux will also note that the init system is ‘systemd’, which has been helpful in providing reasonable boot times. If you are looking for the journal, you can explore it using ‘systemd-journalctl’. Drivers and firmware for many common USB WiFi dongles are included, so be sure to report any that you find missing. An issue with the driver for the Logic Supply UWN200 has already been resolved since the release[**]. To test it out myself, I uncommented and edited the wlan0 entry in /etc/network/interfaces (including replacing wlan0 with ra0), shutdown, plugged in the adapter and powered up the board again. I also was able to plug in a TL-WN822N adapter I bought from Amazon and got it working right away. This is just a quick intro to some of the experience and what we are focused on fine tuning. Please take the time to check it out and let us know about your experience. I hope you enjoy it!